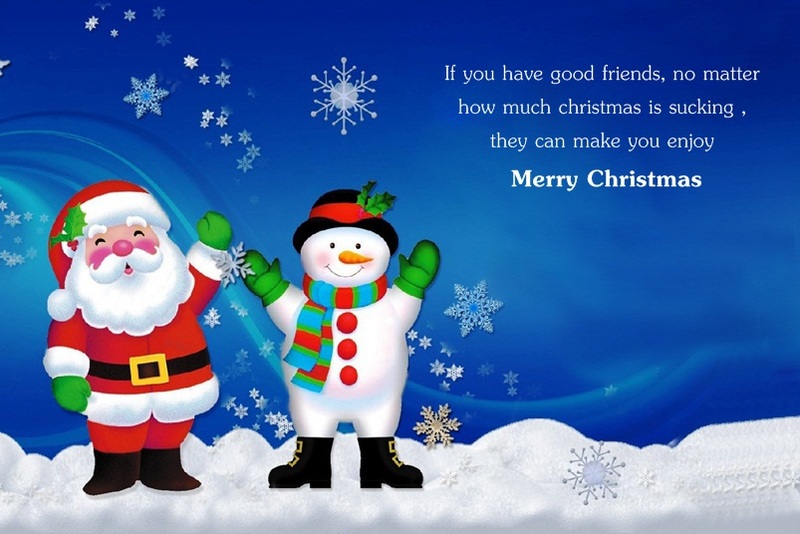 Merry Christmas Quotes - MD SHAHZAD HASSAN - Blog. 1-And know that I am with you always; yes, to the end of time. 2-At Christmas play and make good cheer, for Christmas comes but once a year. 3-Christmas isn't a season. It's a feeling. 4-He who has not Christmas in his heart will never find it under a tree. 5-Christmas is a season not only of rejoicing but of reflection. 6-God is in the details. 7-Nothing says holidays, like a cheese log. 8-Please to put a nickel, please to put a dime. How petitions trickle in at Christmas time! 9-Christmas is joy, religious joy, an inner joy of light and peace. 10-Christmas, my child, is love in action. Every time we love, every time we give, it's Christmas. 11-Don't let the past steal your present. This is the message of Christmas: We are never alone. 12-Santa Claus has the right idea - visit people only once a year. 13-Coming from Chicago, I like a white Christmas. 14-Mail your packages early so the post office can lose them in time for Christmas. 15-Maybe Christmas, the Grinch thought, doesn't come from a store. 16-Christmas makes me happy no matter what time of year it comes around. 17-Christmas is doing a little something extra for someone. 18-Expectancy is the atmosphere for miracles. 19-The two most joyous times of the year are Christmas morning and the end of school. 20-A good conscience is a continual Christmas. 21-Christmas is, of course, the time to be home - in heart as well as body. 22-Let's be naughty and save Santa the trip. 23-Christmas is the day that holds all time together. 24-Christmas, children, is not a date. It is a state of mind. 25-I once wanted to become an atheist, but I gave up - they have no holidays. 26-I will honor Christmas in my heart, and try to keep it all the year. 27-My Christmases have always just been very simple and about family. 28-What I don't like about office Christmas parties is looking for a job the next day. 29-It is a fine seasoning for joy to think of those we love. 30-Christmas is a time of year that's so romantic. 31-People say I don't write books, I make Christmas presents. 32-'A Christmas Story' has always meant a lot to me personally. 34-The excellence of a gift lies in its appropriateness rather than in its value. 35-The best Christmas present I got from my husband was a week to do whatever I wanted. 36-There's something about a Christmas sweater that will always make me laugh. 37-I get a little behind during Lent, but it comes out even at Christmas. 38-At Christmas our house is like a Donnie and Marie Christmas Special. 39-I'm not going to tell you to meditate on what Christmas really means and be thankful. 40-I love singing Christmas carols. I know every harmony to every music-hall Christmas song. 41-That's the true spirit of Christmas; people being helped by people other than me. 42-There's been a concerted effort to steal Christmas. 43-I beg to present you as a Christmas gift the city of Savannah. 44-There's never really been a real hood Christmas movie. 45-There would be no Christmas if there was no Easter. 46-There's nothing sadder in this world than to awake Christmas morning and not be a child. 47-Christmas carols always brought tears to my eyes. I also cry at weddings. I should have cried at a couple of my own. 48-For many, Christmas is also a time for coming together. But for others, service will come first. 49-Christmas is a holiday that persecutes the lonely, the frayed, and the rejected. 50-Halloween starts earlier and earlier, just like Christmas. 51-I love all things Christmas. 52-The smell of pine needles, spruce and the smell of a Christmas tree - those to me, are the scents of the holidays. 53-Comic-Con is nerd Christmas. People go wanting to have fun. 54-I grew up as a photo nut. Every Christmas I would get a new camera. It's a huge part of my life. 55-One thing I love about Christmas music is that it has a tradition of warmth. 56-I read the Scriptures at the American Cathedral on Christmas and Easter; that's it. It's a task I love. 57-I think 'Elf' is funny, with Will Ferrell. That's a great Christmas movie. 58-Besides the two Christmas things, we've got a about a dozen new tracks we're working on. 59-A simplified Christmas isn't about circumstances as much as it is about focus. 60-I was a postman one Christmas and I developed a morbid fear of dogs. 61-I wanted an electric train for Christmas but I got the saxophone instead. 62-I'd rather do community service than sit and write a load of Christmas cards. 63-I like the idea of putting your Christmas wish list up and letting people share it. 64-Next to a circus there ain't nothing that packs up and tears out faster than the Christmas spirit. 65-Windows are as essential to office prestige as Christmas is to retailing. 66-During the holiday season, Christmas specifically, it can be hard to be away from family and friends. 67-For a Jewish guy, I've recorded a lot of Christmas albums. 68-I'd like to do a Christmas album. I've never done a Christmas album. 69-Don't give me books for Christmas; I already have a book. 70-The earliest you can play Christmas music is on Thanksgiving. 71-Christmas makes everything twice as sad. 72-A Christmas Carol is such a fool-proof story you can't louse it up. 73-We never really had any kind of a Christmas. This is one part where my memory fails me completely. 74-One Christmas my father kept our tree up till March. He hated to see it go. I loved that. 75-I love cooking during Christmas, all smells like the hot apple cider, the hot spiced wine. 76-I'm learning Spanish - I got Rosetta Stone for Christmas. 77-I like to spend Christmas with family and friends, pigging out, exchanging gifts and basically doing nothing. 78-Online, there's no time. It's always Christmas. 79-The Christmas genre is a field that's been well-ploughed. 80-My family always makes a huge deal out of Christmas. 81-On the whole, I prefer Christmas as an adult than I did as a child. 82-No matter where I am in the world, I will always be back home for Christmas. 83-Christmas is over and Business is Business. 84-I might do 'X Factor' next year. It's looking good that I won't get the sack at Christmas. 85-You are not practicing Judaism if you celebrate Christmas. 86-Tax cuts should be for life, not just for Christmas. 87-Christmas in L.A. is weird. There's no snow. It's not even cold. 88-Once you start a business, you have to grow it and grow with it - starting a business is not just for Christmas. 89-I don't know if anybody's ever ready for another award season. It's kind of like Christmas. 90-Every singer eventually gets around to a Christmas disc. 91-I loved the first Christmas I had in England. 92-'A Christmas Story' is my favorite Christmas movie. 93-My parents still treat Christmas like I'm thirteen years old. 94-Christmas is the antithesis of Thanksgiving. Christmas is pretty much a man-made holiday. 95-I hate feeling full, so Christmas is about the only time I really stuff myself. 96-Christmas albums are not something you do frequently. 97-There are very few people who have done more than one Christmas album. 98-I'm not going to put out a Christmas CD until it's coming out of me naturally. 100-My early business ventures included growing Christmas trees and breeding birds.